1994 was the best of times and the worst of times. I had just started my dream job as Director of Marketing at Chicago’s incredible Museum of Science and Industry. Great salary, great benefits, next right step in my marketing career and a chance to go to my childhood wonderland every day. All 40 acres of it. 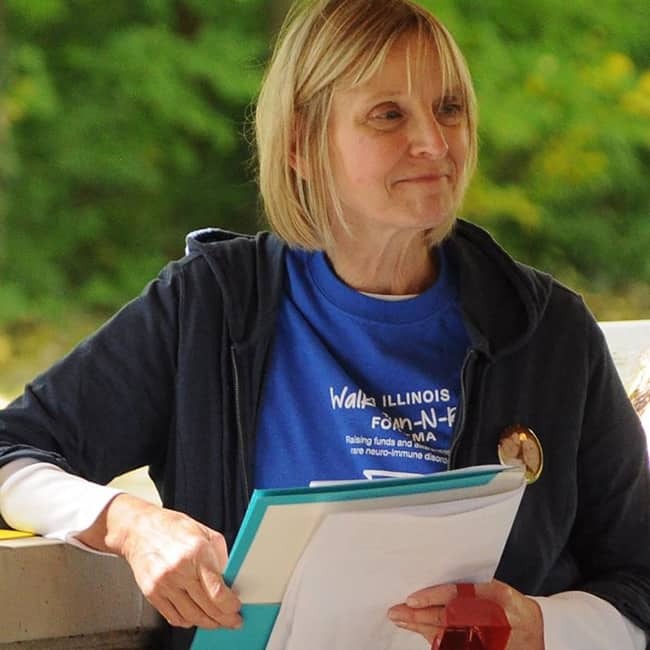 It was the worst of times because my mother and best friend had been diagnosed with ALS. Our family had never even known anyone with ALS except Lou Gehrig. But it was true. She had ALS and she was going to die a slow, terrifying death. And I would be there to watch every minute of it. The winter after she died, I developed a very bad case of the flu. My neck was especially painful. But I was practically numb from grief, so I soldiered on. Some days, my feet and legs felt so heavy I could hardly put one foot in front of the other. Around that time, I went to a conference in San Diego. After dinner one night, I went exploring with colleagues. As we walked, my legs got heavier, stiffer and increasingly numb. Suddenly I walked out of my shoes and swan-dived on the sidewalk, face first. My colleagues helped me back to the hotel. I called my husband and cried for hours, believing this was the beginning of ALS. What followed were lots of exams and tests including an MRI of my lower back and an evoked potential test. There was no ALS–nothing. Diagnosis: depression. “Oh honey, you just don’t want to move forward, now do you?” I was started on anti-depressants, scheduled for psychotherapy and presented with the idea of electroconvulsive therapy for severe depression. For the next 17 years, I continued to have difficulty walking, urinating and using my hands but never became completely paralyzed. I had lots of falls, lots of UTIs and waited to see if my symptoms turned into ALS or MS. One doctor suggested fibromyalgia, but the symptoms did not fit. They never changed for better or for worse. I changed careers to a job where I could sit more. Then, in 2012, I went to an endocrinologist for an unrelated thyroid nodule. As I was leaving, he said, “why do you walk like that?” In 17 years of seeing doctors of every kind, no one had ever asked me that. He had my undivided attention. “Maybe fibromyalgia?” I said. I had been waiting 17 years for a doctor to acknowledge something was wrong. I moved very quickly. I found a doctor at Northwestern Memorial Hospital, had an MRI of my cervical spine, and heard the words “transverse myelitis” for the first time. There was “old” damage to my spinal cord at C5-C6. It was too late for treatment but not too late to feel the intense gratification of knowing at last I was not alone and not crazy. It took a few more months to find TMA which led to meeting others with TM, NMO, ON, and ADEM for the first time. What sweet and tearful times those were! Today, I volunteer for the TMA whenever I can. I’m driven by a passion to let the world know that TM exists and should be considered anytime there is unexplained weakness, numbness or paralysis. It can happen to anyone at any time. It happened to me.